Like Holiday just do surveying and panning the riverside or land areas. Beside that those prospectors and treasure hunting, they use gold and silver locator system can find natural gold targets like gold nuggets or gold veins but also buried gold objects like jewelry, ornaments, gold or silver statues, bars, gold rings or gold and silver coins. As long gold or silver objects, in any form. When, sometime i try to suggest here the specific kind of areas. 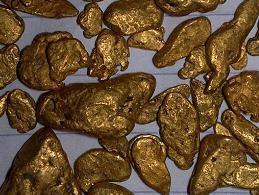 Where can, may interest and might find gold, like WWII cache or Natural gold. Probably want ask why don't go get it, yourself ? and this a question ! but nobody can really be that specific, the reason that all of us should understand the general types of areas, Where gold can possibly be found, is to save ourselves. [ profession as well as novice ] attempt at recovery and found. The formation of the mountain. The various fault systems and intrusions were laid down and in the course of time, forming of the mineralised areas, dykes, lenses, lodes, and veins took place. Heavy rain fall become erosion of the exposed surfaces occurred over great periods of time which covered over most of the formations. Which weathering process will cause an exposed outcrop to the force of gravity and roll down the side of the mountain. Also depend the weather, if the weather is good everyday operation. Belong to local people there in charge by the village chief and Head of district. 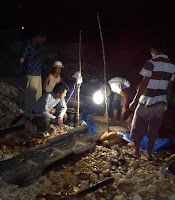 Those people there are friendly and collaboration with me in surveying, small mining and panning at their own village. Due to my fund are not enough to go medium size operation. We have permission granted by them, and join operation work. The gold nugget there are a most pure gold 96%. I have surveying several area and other location but we keep as a confidential. After the operation late evening checking stock and production, go to video above. 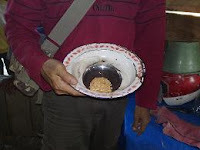 1) Availability of easy to use highly efficient gold pan. 2) Production of light weight portable dredges, can mobilize easily. 3) Metal detector can assist and experience some basic geologist in searching and explore the areas.